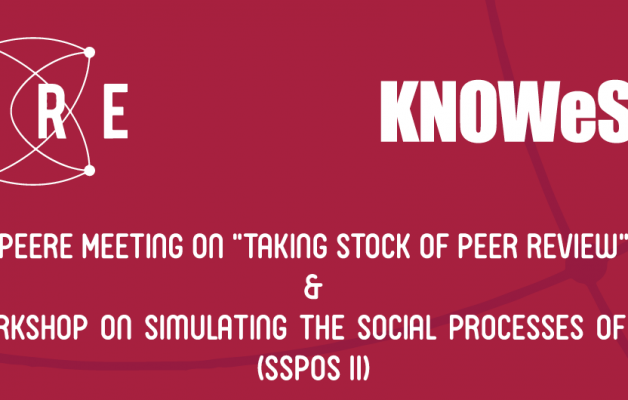 PEERE Meeting on “Taking stock of peer review” and the 2nd Workshop on Simulating the Social Processes of Science (SSPOS II) takes place 8th – 11th March 2016 in Valencia. In this interesting event we looking forward to keynotes (Warren Thorngate (Carleton University, Canada) will talk on “Social processes of science consumption: peer review versus public interest?”) and other interesting scientific reflection about social processes in science, including peer review. But, the programme also lists the possibility to get trained in peer review and to engage in working groups about the future of peer review in scholarly communication.